Elk Mountain, PA: Best in the Keystone State? “Skiing in Pennsylvania.” It doesn’t exactly roll off the tongue easily, does it? To most people’s ears, it sounds about as intuitive as mountain biking in Nebraska or surfing in Brooklyn (both of which I’ve tried). 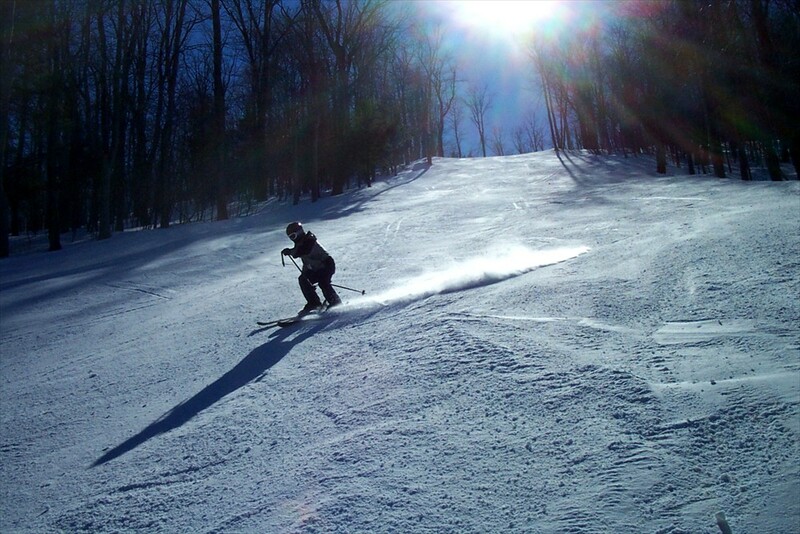 But amazingly enough, I recently learned that with more than three million skier visits annually, Pennsylvania’s 28 downhill ski areas now rank fifth in the nation, surpassing even the state of Utah the last two years. While this figure is more a function of being geographically situated within a short drive of several large metropolitan areas, it’s safe to say that people in and around Pennsylvania like to ski. Unfortunately for them, most of the lift-served hills in the state share a reputation for small vertical drops, paltry snowfalls, flat pitches, hard conditions, too many people crowded into sparse terrain, and little or no challenge. For all but novice and lower intermediate skiers, it often makes more sense to hop on a plane and fly west, or bite the bullet and drive a half-day to Vermont or upstate New York. When I told a friend about my plans for Presidents Day weekend, he asked me incredulously, “Have you ever skied in Pennsylvania?” I told him that my knowledge of Keystone State ski areas was meager at best. Every winter, I pass billboards advertising skiing at Jack Frost and Shawnee on Route 80 just west of the Delaware Water Gap. About 20 miles further down the road, I often drive by a fully illuminated Camelback Mountain. The only area that gave me reason to breach this personal no-ski zone was Elk Mountain, just south of the New York state line. I’d read a few positive online comments about it being “best in PA” and having “terrain that will remind you of Sugarbush, combined with the grooming of Okemo.” Last season, Elk also cracked Ski Magazine’s Top 10 lists for grooming, snow quality, and value. And while it’s difficult to take Ski Mag’s popularity contests seriously, I decided to give Elk a try. I arrived at 9:30 am to find the main parking lot almost completely filled with young families. Since it was a mid-winter holiday, I began mentally preparing myself to spend most of my day in lift lines, and then elbowing my way down the hill through swarms of school kids. But when I got out on the slopes 15 minutes later, I encountered nothing but deep blue skies and clear sailing. Even with the big crowds, the four slow-poke fixed-grip lifts did a nice job of getting people out of the base area. In fact, the entire day, I never waited more than one minute for a chair. Even more impressive was how Elk’s trail network spread people out nicely and often left me almost completely alone for long stretches. I warmed up on a couple of very moderately pitched blue-square runs, Delaware on the far skier’s right and Mahican on the far left. As I glided down from the summit, the highest elevation in Eastern Pennsylvania, I took in some nice views of the scenic countryside — rolling hills dotted by small farms all the way to the horizon. Like many of the smaller eastern ski areas I’ve visited this season, Elk had no condo developments, hotels, or two-million-dollar second homes cluttering up my view. Most of the intermediate trails were a bit innocuous; however, black-diamond runs such as Tuscarora and Susquehanna started with some decently pitched drops, then twisted and turned intriguingly down the mountain’s 1,000 vertical feet without noticeable flat sections. I also appreciated that they were designed to avoid intersecting any green or blue trails until the bottom of the hill. There were even some fun bumps on Upper Tunkhannock, right under the north chairs. With an annual average snowfall of only 80 inches, extensive snowmaking and edge-to-edge grooming are the law of the land around here. Moreover, they’ve planted thick stands of Norway and white spruce trees over the past 30 years as part of an ongoing program to help keep the snow from blowing off the mountain. Although the terrain comparison with Sugarbush is obviously wishful thinking, Elk exceeded my expectations on a variety of levels. The area’s consistently pitched, straight-down-the-fall-line trails, conscientious grooming, and family-friendly atmosphere are as good as it gets in this part of the ski universe. More than 100,000 skier visits a year prove that Elk is doing things right, and the next time I’m passing through northeastern Pennsylvania, I’ll definitely go back. I’ve been to Elk a handful of times. I like the mountain, but hate the policy against riding in the trees. It is a great feeder mountain – great for family and learning. But i have found the best terrain to be at Blue Knob, out towards Pittsburgh (not to be confused with blue mountain north of philly). 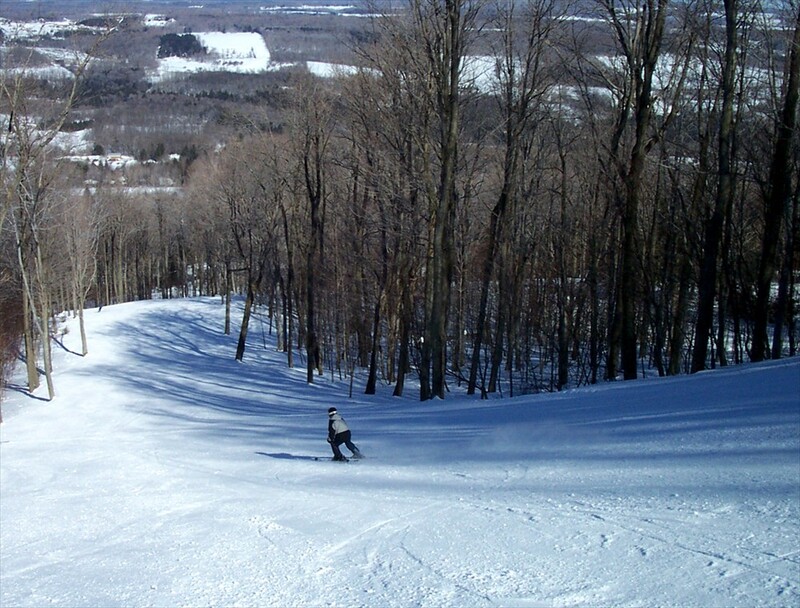 While the best terrain at Blue Knob is on the lower part of the mountain – which means only 700 vertical feet, it is far more difficult and varied. If either Elk or Blue Knob is all I can get to for a day, I’d go to Blue Knob 9 out of 10 times unless conditions dictate otherwise (powder). Plus, Blue Knob has a few glades. After these two mountains, I hope to be going somewhere other than Pennsylvania. Elk and Blue knob as stated below are PAs best. Better snow and conditions in general at Elk. Each mountain has their own character and both can be enjoyed under the right conditions. By pass the rest in then state and head to Blue Knob or Elk.